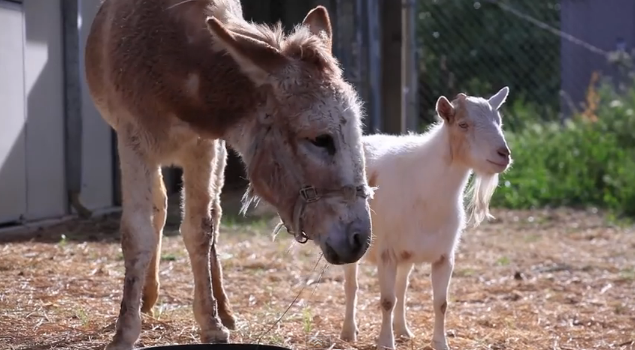 When their owner can no longer afford to take care of them, a goat and a donkey were brought to separate animal sanctuaries. Mr. G, the goat, was taken by the Animal Place sanctuary in California while Jellybean, the donkey, was taken by another sanctuary. The bond of friendship between the two is so strong that their separation took its toll especially on Mr. G.
After arriving at Animal Place, Mr. G went on a hunger strike that went for several days. He simply refused to eat no matter how hard the sanctuary staff tried to coax him. They gave him molasses, apples, and sweet grain but he refused to touch them. That's when the Animal Place staff decided to go get Jellybean from the different sanctuary and reunite him with Mr. G. Their reunion brought back Mr. G's vigor and had him eating again after over six days of not eating anything. The two animals have been brought to a permanent sanctuary in Grass Valley (also in California) where they will live out their lives in the company of each other.